WHILE their stalls are being upgraded, 36 hawkers from Redhill Market are using the time-out to learn new skills. Yesterday, they were awarded certificates by Mr Sam Tan, Senior Parliamentary Secretary for Foreign Affairs, and Community Development, Youth and Sports, after taking part in a two-day camp. The fully subsidised initiative taught service etiquette and communication skills. This is the first such effort to engage hawkers during a job lull, said the Employment and Employability Institute (e2i) of the National Trades Union Congress. Redhill Market,which has more than 100 hawkers selling food and fresh produce, closed in May and is due to open early next month. 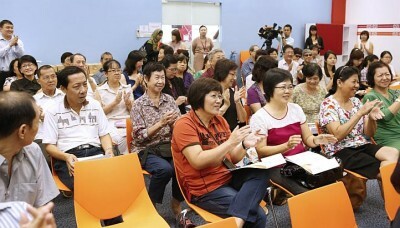 Short booster courses lasting one to two days - while hawker centres are closed for cleaning - may be considered, he added. Most of the 36 in the programme, who are aged above 50 and have primary education, were initially hesitant about returning to the classroom. 'It is not an easy experience for those who have left school for many years,' said Mr Tan, who had met the hawkers on their first day of class. For coffee-stall helper Mary Goh, 57, who signed up only after months of deliberation, it was a good experience. She said she learnt to pronounce words and remedy behaviour not considered proper etiquette. All 36 have moved on to a six-day English literacy workshop that teaches conversational skills. 'Every day, the hawkers meet many people who speak English,' said Mr Tan. Regarding plans by the Workforce Development Agency (WDA) to set up a hawker training centre, he added that he believes such courses could be a 'very good test-bed'. 'Because they involve actual hawkers, whatever modules taught will be very useful feedback for the WDA to evaluate and assess the lessons,' he said.